Our first visit to the Pearl of the Orient many years ago, ensured we’d return to Penang as often as we could. Since the improvement in the road system, both along the peninsular and on the island the drive is easier. Airport upgrading and more airlines, with International access makes it easier. And it’s now a quick 4 hour trip by train to Butterworth from Kuala Lumpur. Also easy. With at least 5 ways to get to Penang from KL, and many international direct flights, what are you waiting for? This is absolutely not a definitive list. It’s one that can easily change but for now, here are 10 examples out of the many possibles we’ve considered. People in Penang are generally pretty friendly. Have a chat with the person behind the counter when you make a purchase. Ask what’s in the bowl of soup and what type of noodles they’re using. Ask them to tell you why they’re carrying on an old tradition. Have a chat to the people where you’re staying. Penangites are friendly and passionate about where they live and will happily share information about places to go, the best places to eat. It’s hard to choose between the elderly uncle who repairs wicker furniture in Armenian St or the the aunties making traditional biscuits in various locations. 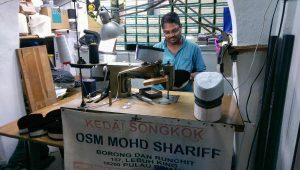 or perhaps the songkok maker at the Chulia St end of Lebuh King. For now, our pick has to be the tin can band in Lebuh Armenian band. 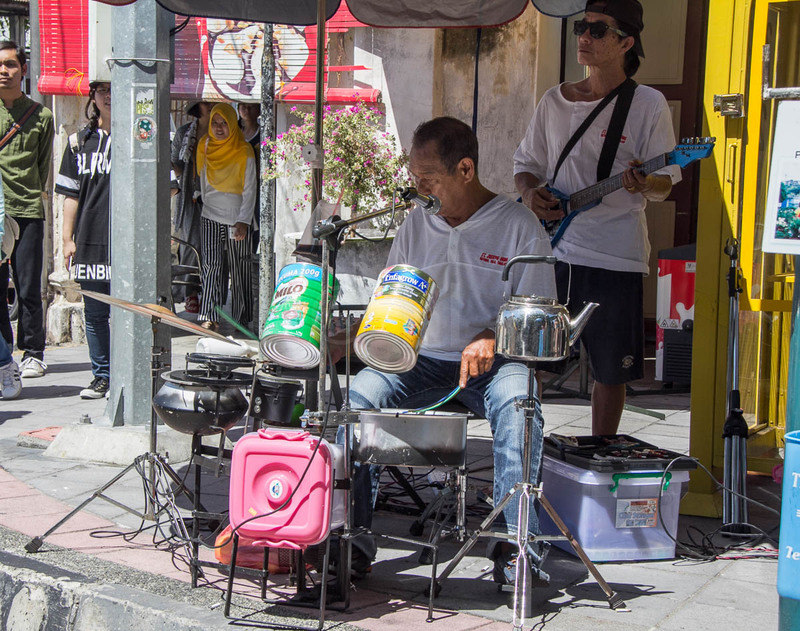 A rather motley crew, they entertain passers-by with old songs and a smile when you check out their unique percussion instruments. 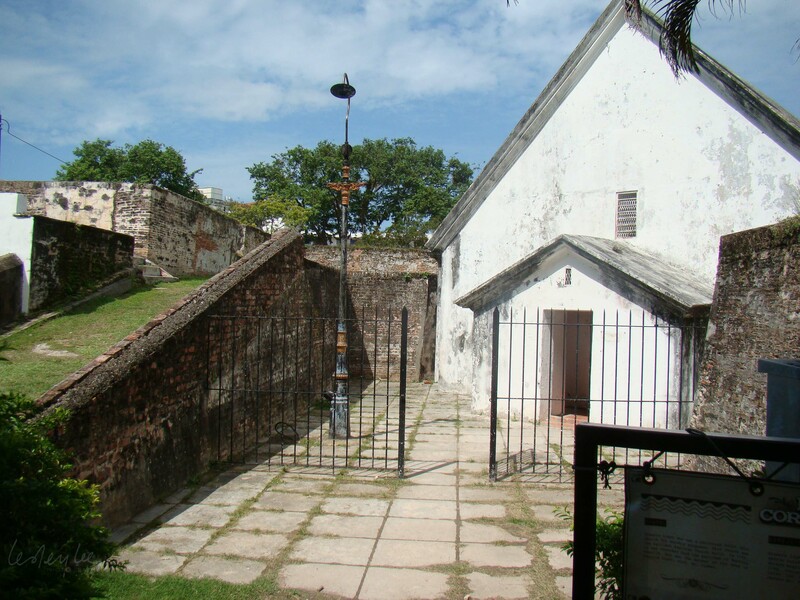 The 7th July is a public holiday for Penang’s annual Heritage Day. On this day there are plenty of interesting activities available to participate in, apart from year round events particular to the various communities contributing to the ‘colour’ of the state. Museums and religious buildings. 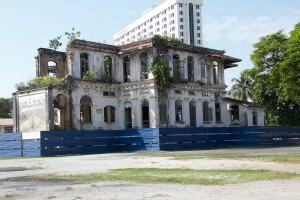 At the time of writing, the Penang State Museum is undergoing refurbishment. Some of the displays and exhibits can be seen in their annex in Jln Macalister, a short walk from KOMTAR. Check out the information about the community roots and where the people are now. 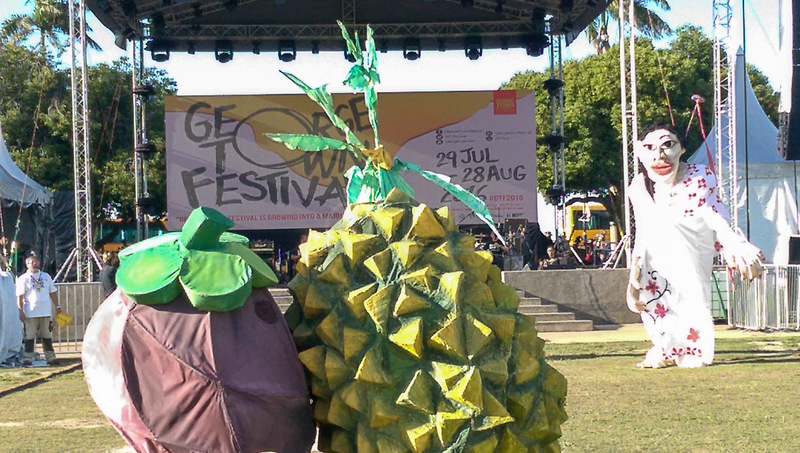 The annual George Town Festival has been a fixture of the cultural calendar each August since 2010. 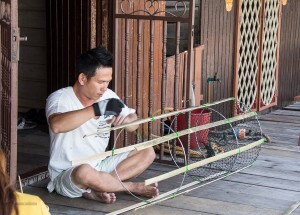 The festival draws on the deep cultural roots of the State’s residents. There’s a wide range of local and international performances, with cultural activities to appeal to every taste. We’ve enjoyed open air shows, theatre performances, exhibitions, walkabouts and food related events. The 2018 Festival returns from 4th August until 2nd September, 2018. Definitely on our calendar for this year. 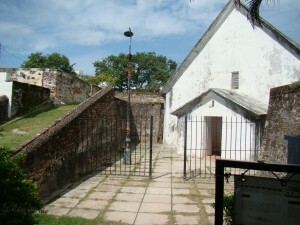 When Francis Light landed in Penang in 1786, there was already a small settlement where George Town is now. He took possession of the island as a British colony and it was first known as Prince Of Wales Island. The island was well placed to become a trading port and quickly attracted a growing community of folks from many countries. 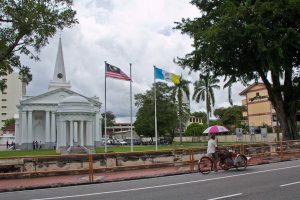 The history of these early residents and immigrants can be found in the Penang State Museum and their homes and religious buildings dot the Island. Many of these homes are now museums. 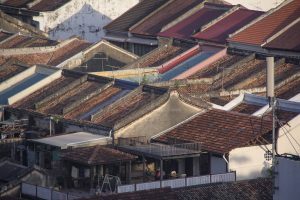 One of the notable features of George Town is the terra cotta roofs of the old shophouses in the Core Zone. Many of these are now being restored and although many of the older residents have moved out, the Council ensures that restoration is done to maintain the integrity and character of the buildings. One of the best examples of restored buildings we’ve found is St Joseph’s Novitiate along Gurney Drive. It can also be approached from Jln Kelawei as it’s now cleverly incorporated into the Gurney Paragon Shopping Mall. 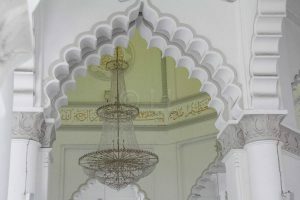 The history of the building and the description of the restoration is described in the central hall. 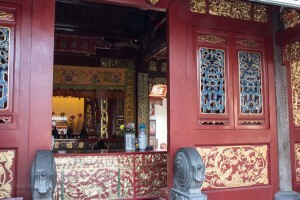 Thanks to the cosmopolitan make up of the people of Penang, George Town has a large number of religious buildings. 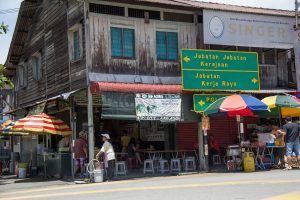 A walk along Jln Burma, which heads west from the intersection with Penang Road at the base of KOMTAR is our pick. There are mosques catering to various communities – Chinese muslims, Pakistani muslims and traditional Malay mosques. Churches catering to Catholics, Methodists and Seventh Day Adventists, and Buddhist and Taoist Chinese temples. Penang’s only synagogue, located in Nagore Road closed down in 1976. However, the Jewish cemetery still exists in Jalan Yahudi (now renamed Jalan Zainal Abidin) which connects Jln Burma and Jln Macalister. Jln Masjid Kapitan Keling will take you past the imposing Masjid Kapitan Keling on the corner of Jln Buckingham. 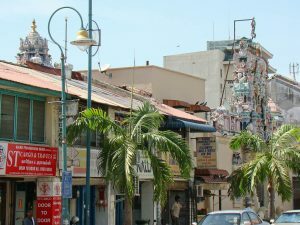 A little further along is the Sri Mahamariamman temple on the opposite side of the road which runs through to the next road over, Lebuh Queen. A little further along is the Goddess of Mercy temple, Kuan Im Teng. 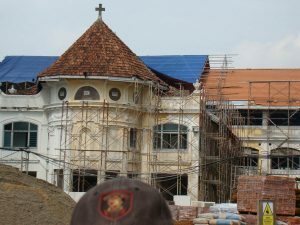 It’s just a few steps along to St George’s Church on the corner of Lebuh Farquhar. This road is not unusual, most of the main roads around George Town have the same eclectic mix of religious bases. 5. Food – come hungry! Leave full! Whether your preferred style is restaurant, cafe, or on the street, you’re well catered for in Penang. Stop for a Devonshire tea when you visit Penang Hill, or enjoy a tiffin lunch at the E&O hotel, Try out nasi kandar (rice and your choice of curry dishes) at Line Clear in Penang Road or any of the other great places across the island. Stop at every second hawker centre or kopitiam and try out the char koay teow/curry mee/lor bak etc etc etc. Hunt down nasi lemak at the Sri Weld Food Court opposite the Feri/bus terminal and see if it really is the best. Or just eat your way along the stalls at any of the morning or night open markets in different locations. Most of the foods available owe their existence to the many and varied immigrants to the island, with their histories reaching back over 200 years. One food you must not miss however, is assam laksa. 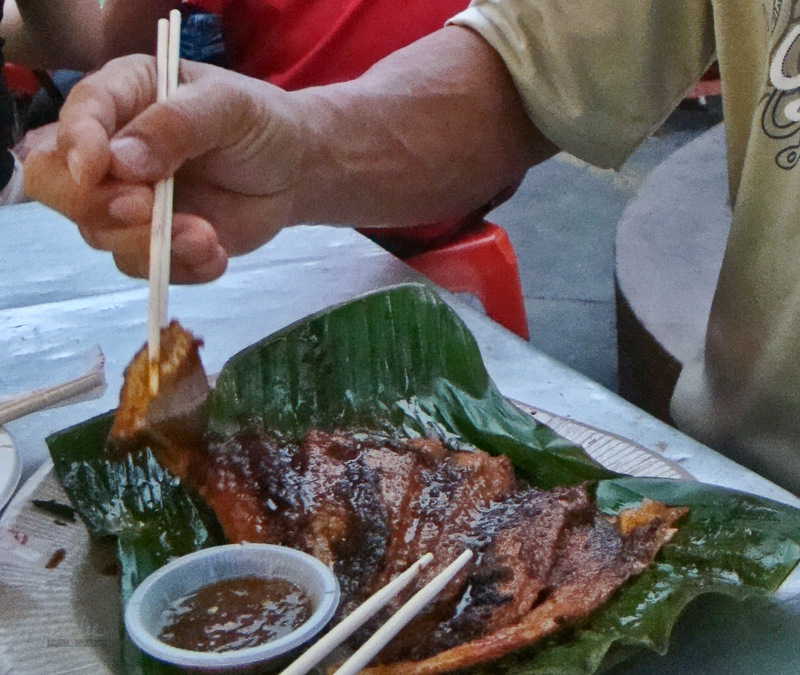 This is the Penang version of a favourite Malaysian dish. Assam laksa uses fat white noodles, in a sardine based soup, flavoured with assam – tamarind paste and mint. Extra flavour comes from prawn paste, which is a personal choice. 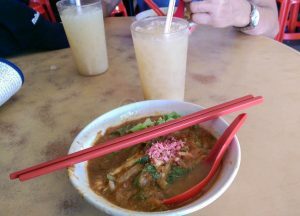 The jury is still out on our favourite Penang food, especially our favourite laksa. Our most recent dilemma is the choice between the one at the inside end of Lebuh Keng Kwee (away from Penang Rd) or Kim Laksa in Balik Pulau. In Lebug Keng Kwee, your bowl comes sans hae koh (prawn paste) but there’s a bottle on the table for you to add if you want. You can also order drinks or even a bowl of chendol, which they’ll get from the nearby stall so you can enjoy it after your laksa. We have to say though, that it’s worth a bus ride to Balik Pulau in the middle of the island. 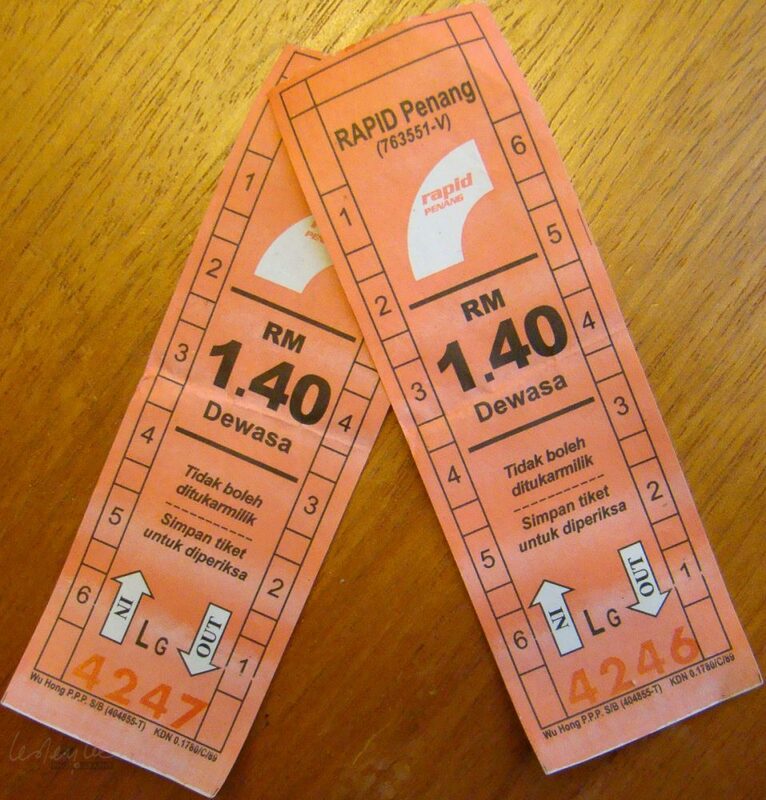 Bus 401 from the Feri or KOMTAR will get your there. It’s a short walk from the bus station to the shop which faces the main road as you reach the main town area. Preparation is quick and efficient and they also have a lemak version not found elsewhere. 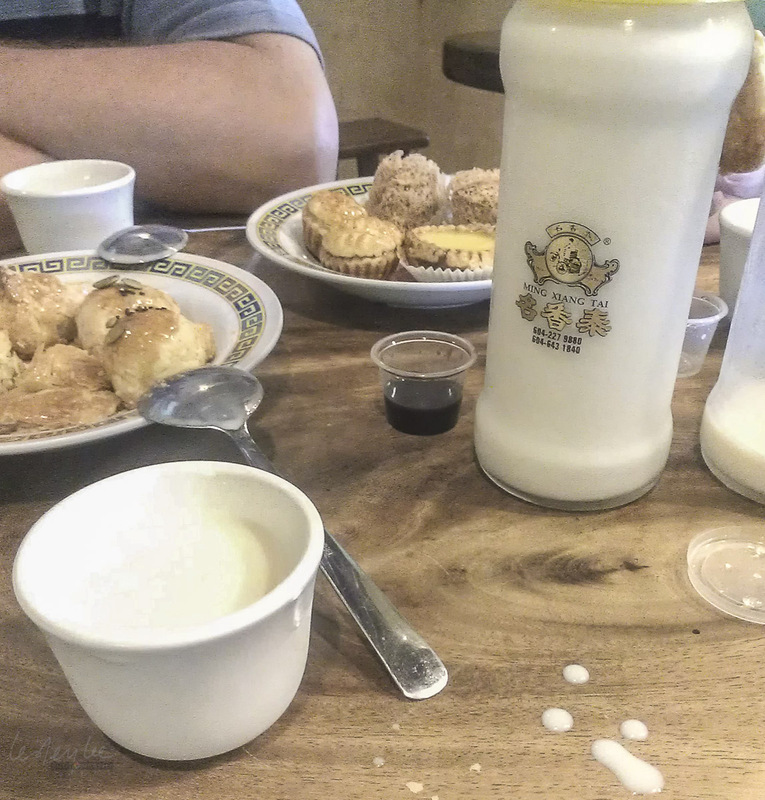 We also enjoyed the home made nutmeg juice. Nutmeg trees grow around Penang and used to be one of the major income earners. Balik Pulau is also famous for its quality durians and there are a number of farms in the area. The market is only open in the morning, so if you want your pick of different local fruits, either arrive early, or ask for directions to one of the farms. A bottle of water is always the best thing to carry, but variety is better! And there’s a wide array of choice for ways to cool down. If coffee’s your thing, you’ll find plenty of choice. Cafe or local kopitiam (coffeeshop) you can take your pick ,whether you’re looking for a latte or a local. A few helpful local choices – kopi (hot, sweet, milky local coffee) Kopi ais aka or kopi peng (iced kopi, sweet & milky) kopi ‘o’ (black, hot and sweet) or kopi ‘o’ ais (same, but with ice). Don’t want it too sweet? ‘kurang manis’ is ‘less sweet’. Ice cream fans might like to try ice cream potong – a square ice block on a stick. Usually sweet, they come in various flavours – try corn or red bean, yam or durian. Most ice cream vendors sell ice cream potong. One of the best thirst quenchers is coconut water. Some stallholders have coconuts ready chilled to chop the top off when you come along, but even warm, coconut water is great for replacing lost electrolytes. Soy bean drink is also a great thirst quencher. 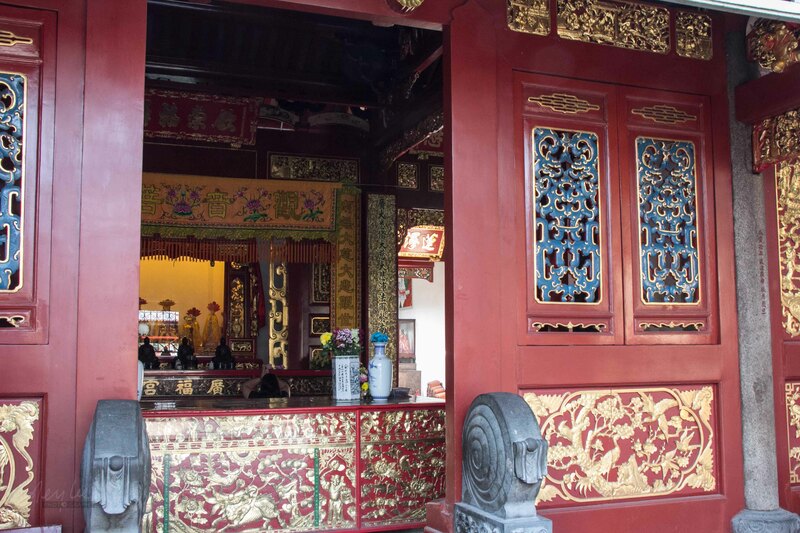 Curiously, every time we’re walking along Lebuh Victoria we feel very thirsty as we come close to Ming Xiang Tai Confectionary, on the corner of Armenian St. The bottled drinks (take home the empty and use for storing condiments) are unsweetened and you can choose to add your own plain or palm sugar syrup. Their pastries are also delicious and can be boxed for later. Despite what cheeky locals may suggest, cendol is not green worms. It’s just cooked pandan (screwpine) flavoured dough served over ice with coconut milk and palm sugar. Delicious. 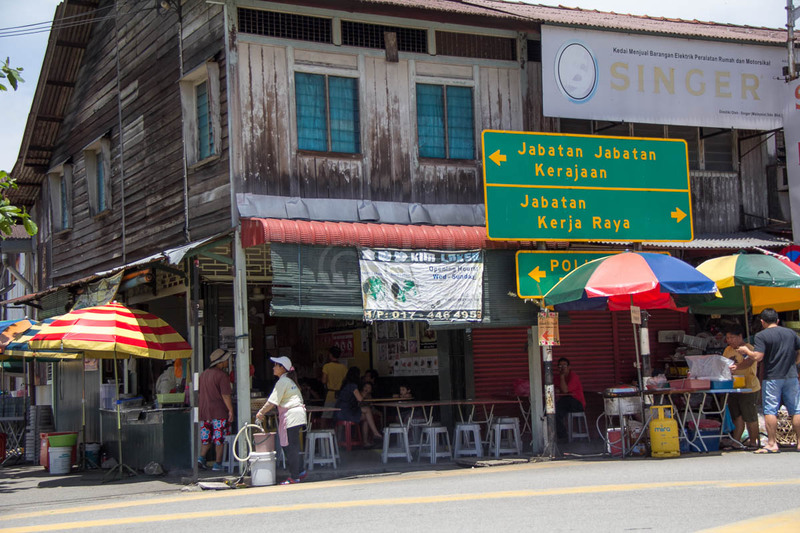 Our favourite cendol is in Lebuh Keng Kwee, on the left as you enter from Penang Road. 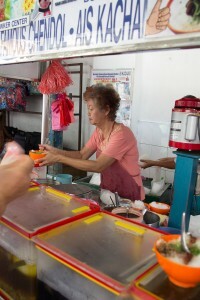 There are two stalls, both famous, but this stall is run by the owners themselves. They’re usually closed on Tuesdays. 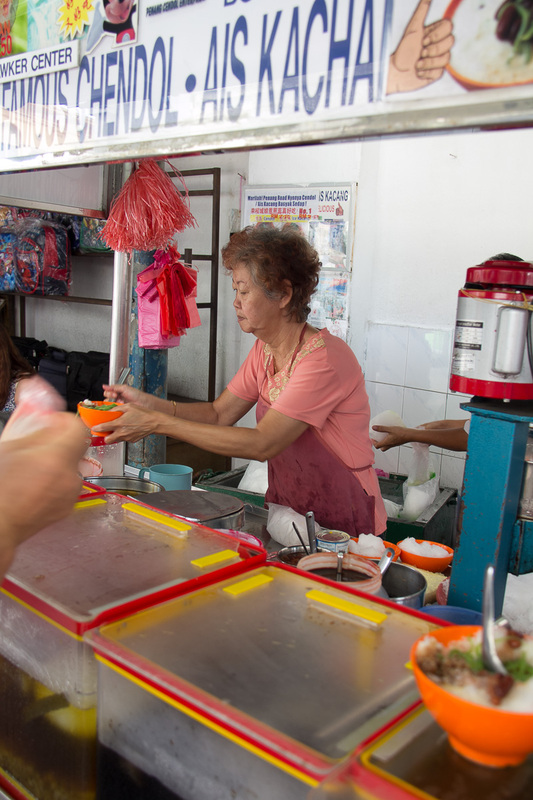 They also serve ice kacang – shaved ice, red beans and corn with pink and green syrup and evaporated milk. 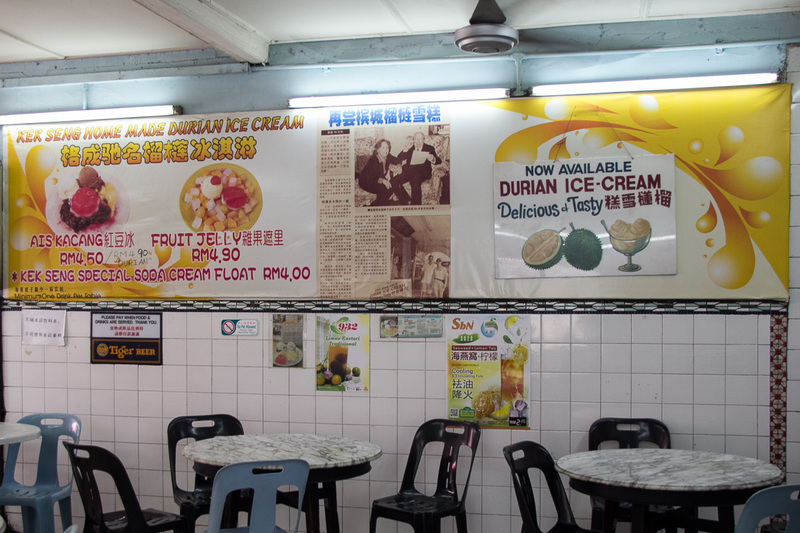 Our choice for ice kachang though, is sold at Kek Seng Kopitiam in Penang Rd, between Jln Burma and Jln Macalister. 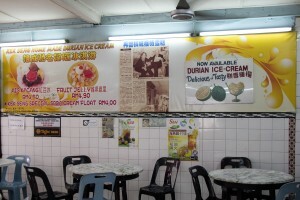 You can choose to enjoy it with ice cream – their durian ice cream is a good way to decide if you’ll try the real thing. There is a wide range of accommodation budget to luxury, in and around George Town, elsewhere on the island and in Butterworth. The Eastern & Oriental Hotel (E&O) has long been at the ‘top of the pile’ in George Town. 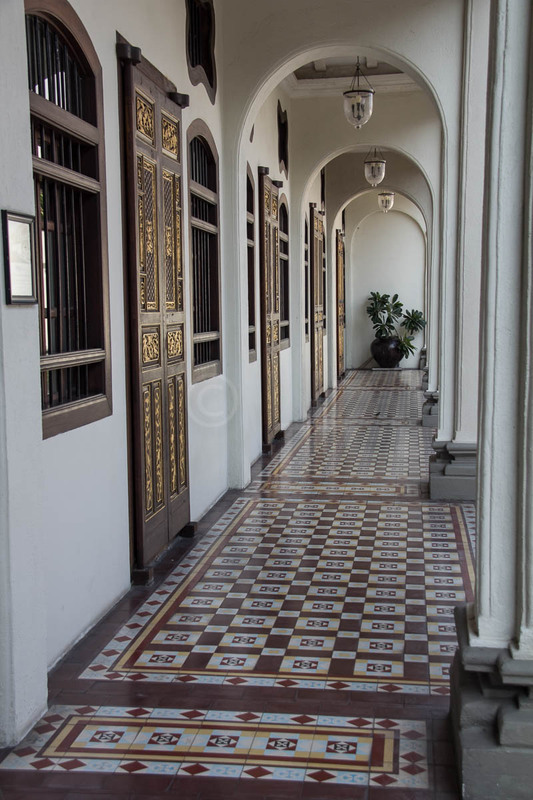 It was set up by the Sarkies Brothers who also have Singapore’s Raffles and Yangon’s Strand Hotel to their credit, in the late 1800s. 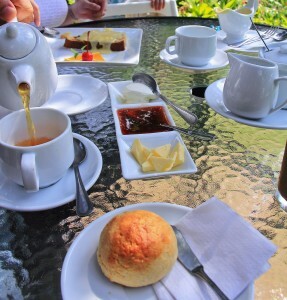 There are other luxury hotels, especially along the northern beaches from Tanjung Bungah to Batu Ferringhi. Families looking for apartments are well catered for as well, both along the beaches and in George Town. 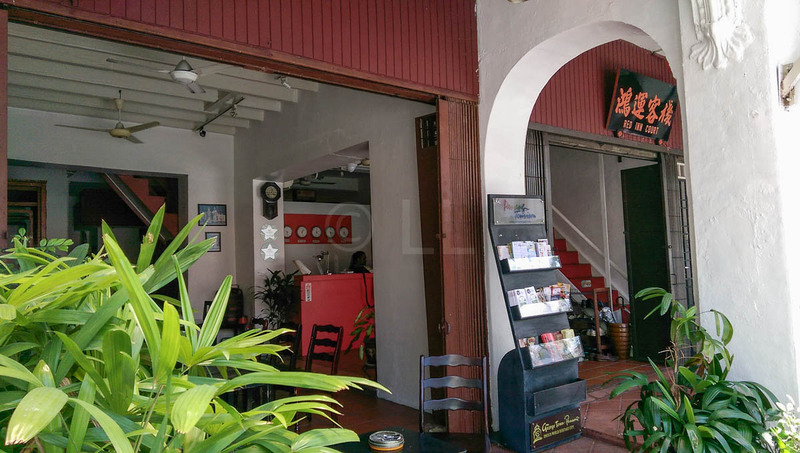 Boutique & backpackers accommodating has become easier to find since the repeal of rent control opened up old buildings in the George Town core zone for restoration. Many of the buildings have been restored and turned into accommodation choices. 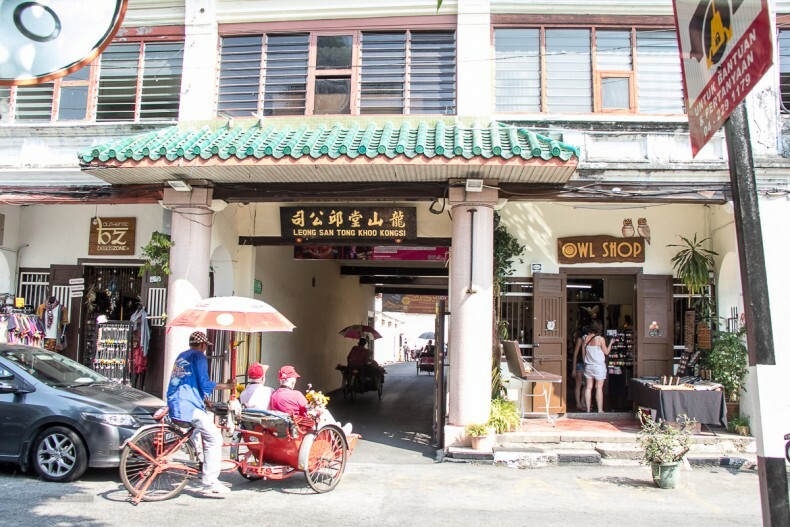 The area around Jln Muntri has a number of tastefully restored shophouses and the Blue Mansion on Leith St offers accommodation, fine dining and daily tours of part of the building. The restored buildings offer a wide price range of accommodation choices. 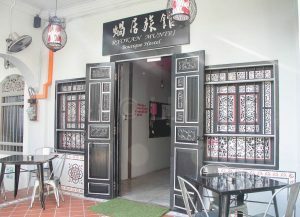 Red Inn Court, along Jln Masjid Kapitan Keling is typical of those catering to backpackers and budget travellers. They offer a simple breakfast with your bed. There’s dormitory accommodation available as well as a limited number of double rooms, with a tiny ensuite bathroom. 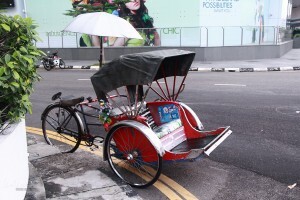 There are a few options for getting about Penang. The Island doesn’t currently have any train services although there are commuter services between Butterworth and nearby towns on the mainland. 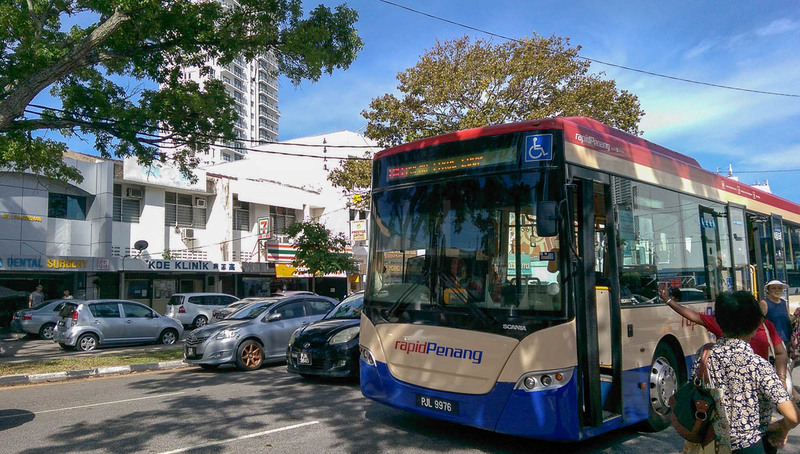 However, both the island and mainland Penang have an extensive bus system, RapidPenang. Taxis are plentiful and they are supposed to use their meters, though this doesn’t always happen. Ride sharing is available and you can use your own car, but be aware that the parking people have sharp eyes, so don’t overstay or park illegally. Around George Town, you can ‘jalan kaki‘ or use ‘shanks‘ pony’ – to the uninitiated – walk! Depending on destination, we’ll go for the paid or Free buses or our own feet. Inexpensive, clean and convenient, as most parts of the island are covered. (We haven’t checked out the mainland. Yet. City CAT buses run a loop around the main town area of George town, you can hop on and off as you like at the designated stops. These buses are free. There’s also a free bus loop running around the Pulau Tikus/Gurney Drive area as well as a growing number of feeder buses in other areas. Drivers are generally helpful to visitors. You need to have the correct change for payment on the paid services. Have some Ringgit notes and small coins handy as no change is given. Best if you want to explore and stop as and when you like. So, we suggest a combination of free and paid buses as well as our own feet. More information on getting around is available in this earlier story. 9. 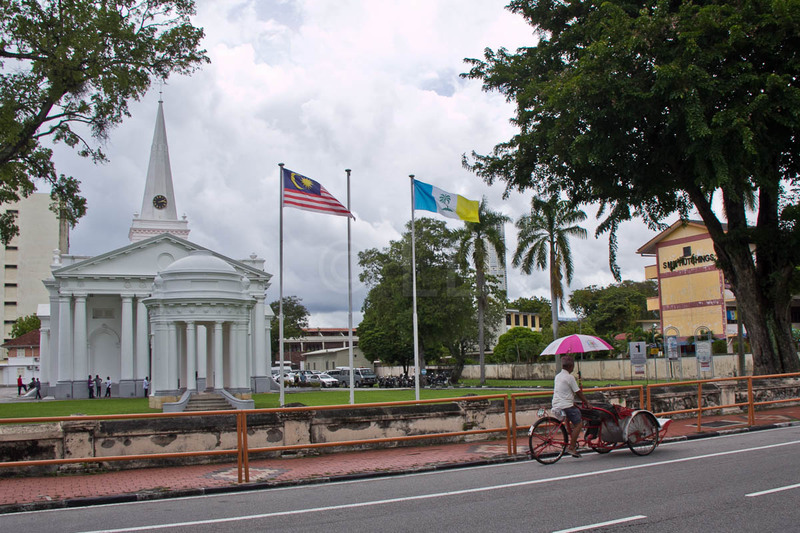 There’s more than George Town! There’s lots more to the state of Penang than the north east corner of the island – George Town. 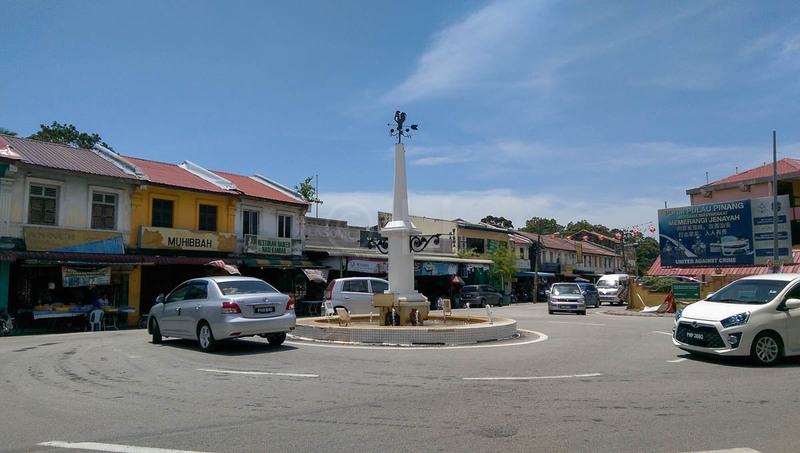 Both Butterworth and Bukit Mertajam on the mainland are well established towns worth a visit. By car or bus you can travel via the Penang Bridge, but the easiest way is by Ferry. 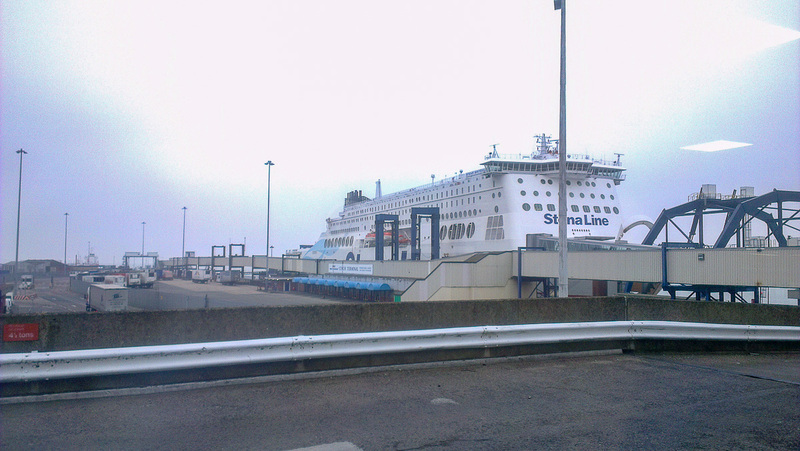 Many of the buses pass the ferry (Feri) terminal, as do the free CAT buses. The ferry takes both car and foot transport between George Town and Butterworth. You can drive to your destination from there or connect to the commuter train for Bukit Mertajam. Bus 101 does the run along the northern beaches. 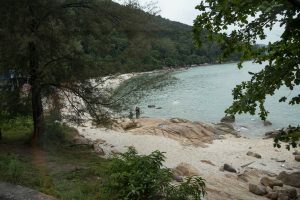 Many or the stops are close to publicly accessible beaches, including Miami beach or the many spots at Batu Ferringhi. There’s a lovely beach just over the road from the Tropical Spice Garden, the next stop after Batu Ferringhi. The Butterfly Park, Entopia, is at the end of the 101 route. Definitely worth a visit, which can be combined with a walk near the nearby reservoir at Teluk Bahang recreational park. Balik Pulau will take at least an hour on the bus, depending on which route you take. You can chose to travel direct, via the airport, or by changing buses at Teluk Bahang. 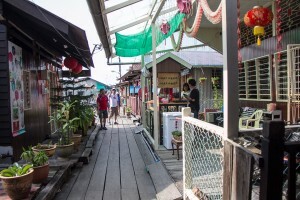 The town is located on the western side of the range which includes Penang Hill and s famous for its fruit farms, with durian being the number one crop. Go early if you want to visit the town market, it’s closed by about midday, but a number of farms accept visitors,. This is easier if you have your own wheels. **TIP Be careful if you want to buy durians to take home. They’re not allowed in hotels or on buses or aircraft and the smell will linger in the car. Balik Pulau is small but definitely worth a walk around and a stop by Kim Laksa at the T-junction. They’re only open Wednesday to Sunday and the shop is usually full. Try their home made nutmeg juice, most other places sell the bottled syrup. Komtar The Top is the top two floors of the Komtar building – the tall round one in the middle of town. 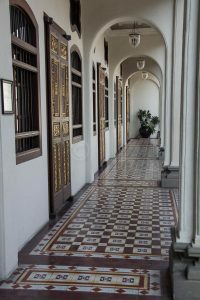 The entrance is not in the main building, but access is from a small entrance opposite Maybank on the ground floor of the Tower. You’ll get a 3600 view of much of the island and across to the mainland and for brave souls, you can walk the glass floor section, or take the bridge walk on the open top floor. Really hardy adventurers can jump off the special platforms but only by special arrangement. Street Art searching has become a ‘thing’ since Lithuanian mural artist, Ernest Zacharevic took up the Penang Council challenge in 2012 to decorate the walls around town. Using bicycles and other props he’s produced may ‘collectibles’ and many other artists have contributed since. 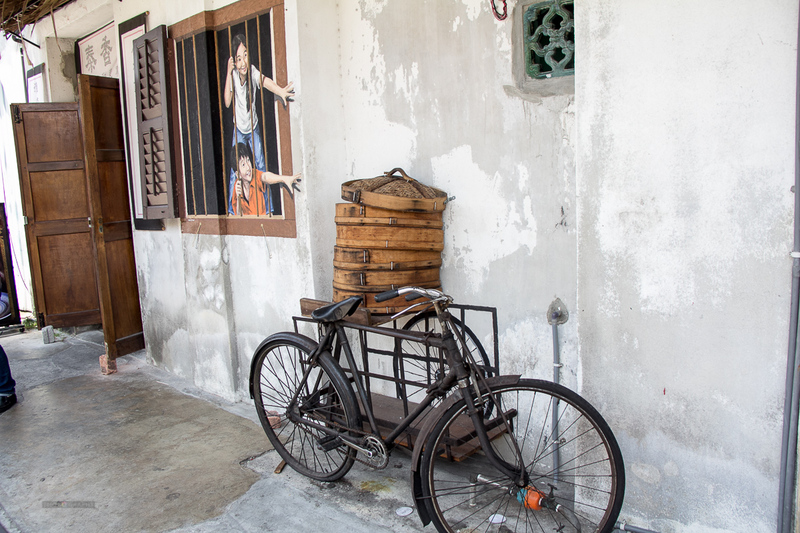 An enduring favourite is the two kids on a bicycle in Armenian Street. Make your own ‘Collection’ of photographs as you walk around. Batu Maung War museum is rumoured to be haunted. Not surprisingly, like many fortifications from the days of WW2, stories of dark dealings make this very believable. We haven’t yet visited the museum, it’s a bus ride and fair walk to reach, on the eastern side of the Penang Airport. If any readers have been, we’d love your comments and we’ll update this once we’ve worked up the courage to check it out ourselves. 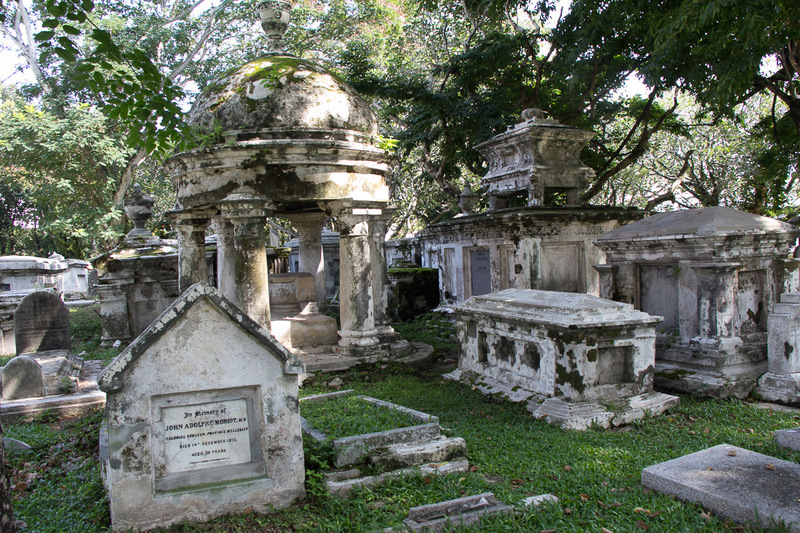 Other locations rumoured to be ‘haunted’ are the the old Protestant cemetery Jln Sultan Ahmad Shah, and the nearby abandoned Chinese school, one of the earliest schools built in Penang. 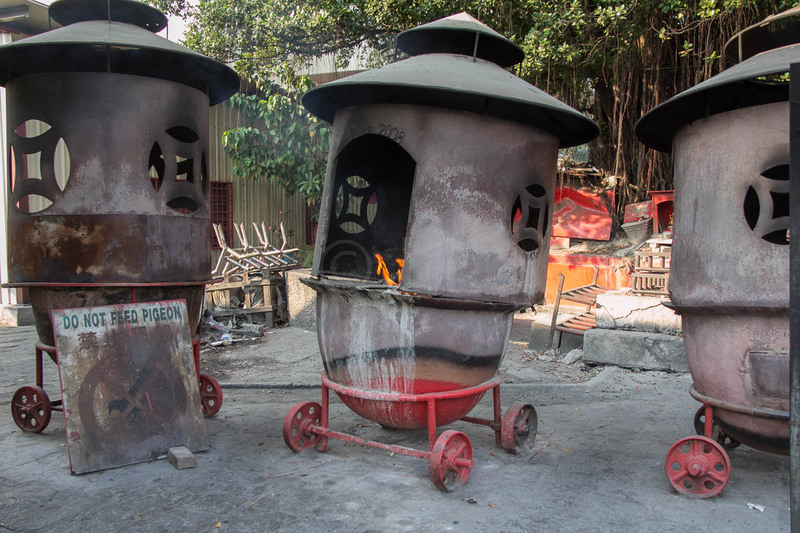 We’re huge fans of all sorts of markets and the local markets are usually on our hit list wherever we visit. Penang has some great wet markets open every day for fresh food – meat, fish, fruit vegetables, cooked food or daily necessities. 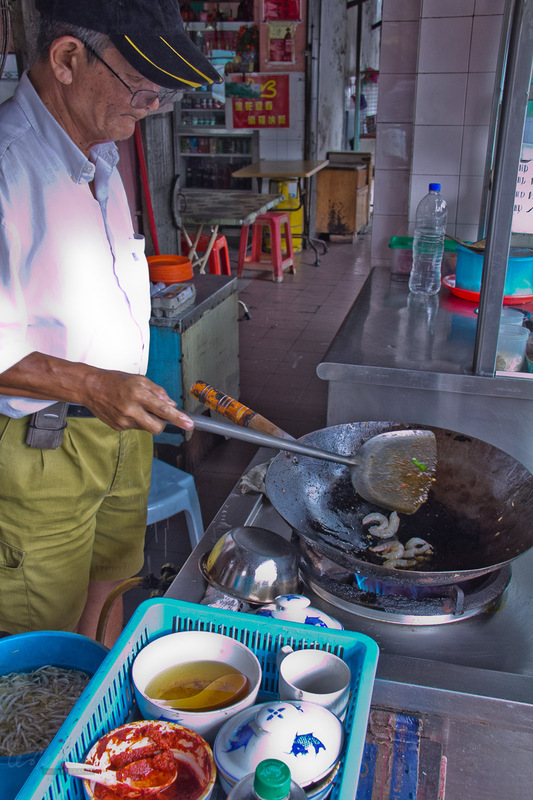 One of our favourites in the Pulau Tikus Market, along Burma Rd, head there before or after a visit to the Thai and Burmese Temples in Lorong Burma. 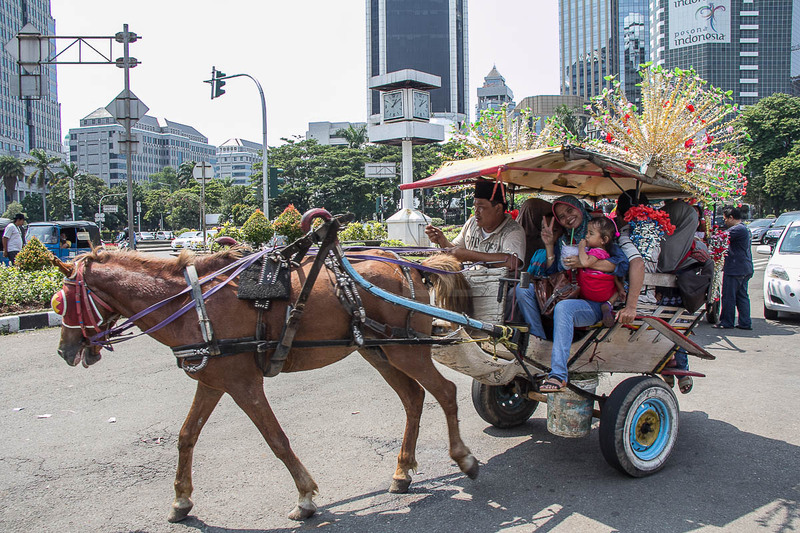 On Sunday, head for Lebuh Pantai in the morning when they close off the whole road for the street market. After that’s done, make your way to Jln Gurdwara – the big GAMA supermarket in the landmark at the KOMTAR end. The Hin Pop-up Market starts at 11, running until 5pm every Sunday. Many of the small shops are also open every day except Monday, but Sunday sees a variety of food and craft stalls open in the big shed in the middle of the grounds. They have entertainers throughout the day and art activities for everyone. Bring your own mugs or plates if you like to be eco friendly and relax in this old re-purposed bus depot.